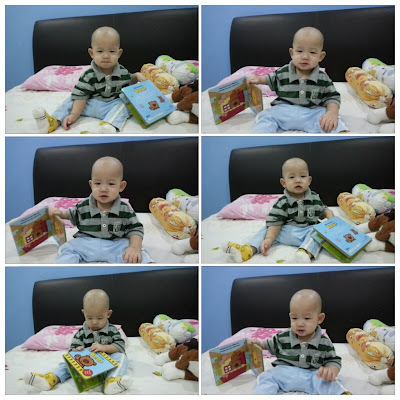 NO, I'm NOT a tiger mum who force my baby to read a book at the age of 8 months. As if I can force him if he doesn't want to. But I always think two things: Start young, and start from home. I started Kenzie with story books, nursery rhymes and flash cards at around 8 months of age, then by the age of 9 months or so, I exposed him to phonics (DVD) and also showing him alphabetical wooden puzzles while reciting the phonics with each alphabet. Before he turned 12 months, he knew his complete phonics from "Aah" to "Zzz" and some simple ABC's. Oh, here's Kenzie boy when he was around 1+. Look at all his educational activities (except sleeping, hehe). Please note that he enjoyed it very much, ok? He chose these himself on the toys rack (over dinosaurs and wagons and trucks and guns) and I did NOT and would NOT force him to do things that he didn't like. So to be fair, I started baby G with the same activity. 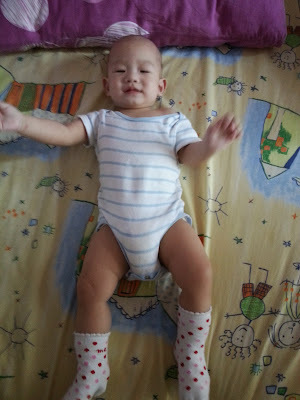 But baby G has different personalities with his elder brother. He doesn't seem to be very interested in books, or when I'm reading to him. Unlike his elder brother, he would concentrate and listen to me when I was reading. His elder brother was very interested in books, numbers, alphabets and shapes before he turned 1. Baby G would lick and chew on almost anything. Flash cards, books, cardboard, you name it. And last night when I was singing nursery rhymes to him from the book, he ignored me and kept targeting at the remote control (to chew). I continued singing anyway, LOL. I treat this as our bonding time. Isn't baby G a cutie pie? Oh, I love smelling that bald head and I can do so for hours! By the way, just for sharing, the below video is one of Kenzie boy's favourite phonics video. Wah, I "behtahan" because it is very "disco-ish". It is very "pop" and way too "noisy" for me. Maybe I am old already and cannot take the "loudness" of the video. Whenever Kenzie boy watches this video, I turn giddy and feel like screaming. But you may like it if you are a hip-pop person. ~ LOL. Enjoy. *Please please, if you have time to layan, check out this video, k? I guess most kids (and adults) will like this (I like it too ok, but if I have to listen to this 100x a day with full blast volume, I think I will go cuckoo). Yep, agree, it has to depend on the kid also.. I never once force the boys to do what they don't like to do leh.. If they show no interest or turn away, then I would stop immediately liao.. 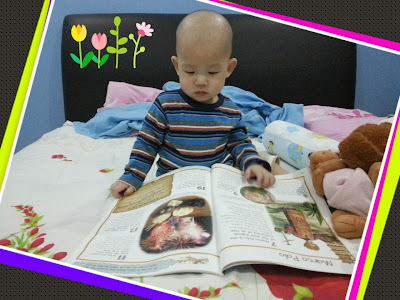 I am not a tiger mom who looks like Guru Disiplin with thick black glasses holding a cane and insist that they must read a book every night la.. Hahaha..
Wah, your friend is a genius wor.. At age 6 but already knowledge equivalent to age 9's brains. So he skipped 3 years and straight went into std 3? Hahaha, yeah, now fantasizing about that.. When the elder one becomes a doctor or a surgeon, and the small one becomes a world-class chef in future, and they buy me a mansion complete with a gardener, a driver and 5 servants, wow, heaven! You must always dream harder so that they will come true. You will become a proud mama someday to see your 2 sons in news! Right? Disco-ish right? I could not take it at one time because it was so darn "noisy", because Kenzie was watching the video for more than 20x a night, he kept repeating, with full blast volume.. Oh my! Yes. This is positive thinking, dear. I also did the same to my eldest abd believe me, it works. Now she grows up loving to read books. She able to master ABC and 1 - 10 before she was 1 yo. She can knows all the phonic sounds then. And she speaks early. Before 3, she able to read some words in the books. As i did not have time for my 2nd child, he was pretty slow in catching up and doesnt show much interest in reading. So for my 3rd one I would do the same as i dud to my eldest. Keep reading, play educational DVD and songs. Kids learn fast qhen they are young. Same here with me. I spent more effort on the elder one, hehe. Now, with this small one, I spent less time and effort with him. Every evening, when I come back after work, I have many chores to do. House chores, etc. And by the time I'm done, I would be too tired to bond with the small one. But now, I make sure I spend at least 15 minutes every night with him. Be it singing or talking (alone). I would show him books and read to him from there, even if it's just one page only. The first borns always got the most attentions from their parents besides having more photo albums and toys. I was the 3rd child born, slow learner and started talking very late. My brother pointed out that once I started talking, I never stopped till now. Stupid bradder! In the last photo, your baby has long legs. He will be very tall and leng chai someday!